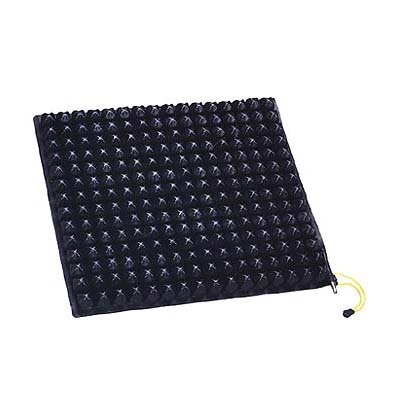 The ROHO Mini-Max Cushion is a low-profile wheelchair and seat cushion designed for short tem use during recreational sport activities, bathing, traveling etc When properly inflated, the cushion's unique grid of 1 inch Dry Flotation® cells fully suspends the user, preventing pressure sores and discomfort. Fully adjustable with the included hand inflation pump, the Mini-Max is ideal for active and energetic individuals at a low risk for pressure ulcers and skin breakdown. The ROHO Mini-Max Cushion is fitted with a unique two-way stretch cover that moves with the user to provide uniform shear pressure and unbeatable comfort. The fluid and odour resistant non-slip base prevents the cushion from sliding off during high levels of activity and is removable for easy cleaning. An included repair kit ensures your ROHO Mini-Max Wheelchair Cushion will provide years of reliable service. Weight limit None if properly sized. I bought this cushion for when I play wheelchair basketball to minimise any damage or wear/tear to my regular cushion , this is a great substitute cushion for me and fits the bill . Quick delivery too so overall very happy.